I set a foot inside a convenience store, GS25, similar to a 7-11 store and I browsed around and eventually came to the front of a glass window where there were bottled waters. There were only two brands—Evian and Jeju SamDaSoo. Evian was a lot more expensive, with all the taxes Korea could impose on imported goods, so I had no choice but to try the Jeju SamDasoo water. It has that typical Korean folksy art and it shows a little picture of the volcanic mountain that’s in the Jeju Island. To be honest, I had expected that the taste would be sub-par, similar to an Aquafina or Dasani. So, after the purchase, I opened the cap and gave myself a big chunk of a shallow. Gulped. My mind said, “Wait a minute, this water is actually pretty good. It doesn’t taste like Aquafina at all and is more similar to the SmartWater. It has that clean taste.” I finished the whole bottle and told myself that’s the one I’ll be drinking often. Later, I decided to do some quick Google research on the brand and learned that it’s actually highly rated. The water is a pure bedrock water that’s undergone a natural process through volcanic rock. 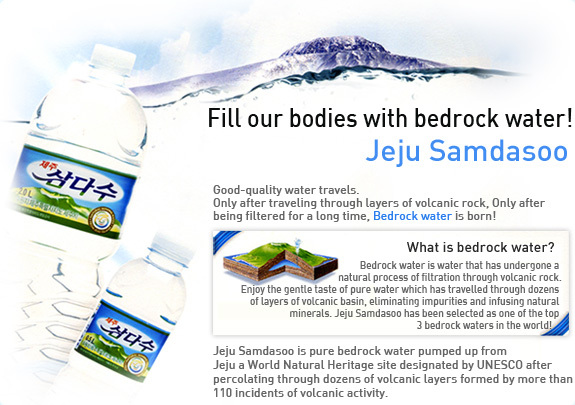 “Jeju Samdasoo” is groundwater obtained from volcanic aquifers located 420m deep in Mt. Halla, the national park of international recognition. Not only the taste of very refreshing and light, but also the quality is uniformed. Due to the natural self-purification characteristics unique to volcanic layer, water quality is very pure and clean. Jeju Samdasoo has satisfied the water quality test standards of FDA of US and Japanese Ministry of Welfare, thus has been recognized of its outstanding quality throughout the world. If you ever visit Korea, please be sure to drink this water! Yes I love this water..But only had the pleasure of two bottles..Have not been able to get here where I live..Maryland..If they can ship to me I will order it..